As an Ofsted registered childminder with the necessary level 3 childcare qualification I am able and legal to deliver the privileged service of care for children in their early years and beyond. I enjoy using the EYFS guidelines in my setting. Additionally, I am also qualified as a level 2/3 Teaching Assistant - Ofqual dated March 2016. My personality is upbeat, bubbly and energetic. I am honest and reliable. I believe I am a loyal person and pride myself by my passionate character. I stand by my word, try hard in everything I do. Self motivated to get out and do something at every opportunity. Since having my children I am excited how young people learn and how adults can support the natural nurturing and memory building in our young peoples' minds. Confidence is not always natural, however, you can build it through experiences and the right life skills education. Health and good food is very important to me and my family. Every week we like to try something new different to open up healthy food favourites. Traveling and culture is a passion. I have many different cultures in my family and we love learning about new places. My family lives all over the world. I so appreciate this because I believe I'm more tolerant because of the exposure to other cultures and beliefs. I came to the UK from the Sapphire Coast of Australia for 3 months in 2000 while traveling Europe. I never left!. I bought a house here in South Norwood and married in 2005. My husband and I have two daughters - 8 and 6 years old. Since the birth of my first child I started to delve into child development (as you can imagine) subsequently, developing a strong desire to spend more time in education involving young children. Its a special position being part of assisting a young one to develop confidence and become independent and happy. Thankfully, this desire has become a reality. In April 2015 I embraced an opportunity to quit work in the city as a Legal PA and be at home while my eldest daughter began the transition into Reception at our local primary school. She is now in year 3 and I am now enjoying the privilege of supporting my 6 year old embark on her very own adventures in year 1. My has a bespoke play room and a toilet on the ground floor. Books!!! We all love books in our home and we have too many to count from all over the world and from many different walks of life and interests. We read books when we are home, out and about, in the park, in the garden and even while on the school run! We have a good sized back yard with a shed literally filled with resources and toys and extra room for sheltered play for outside activities in all weather conditions. Our back yard has a cubby-house, bikes, trikes, scooters and loads of early years fun like portable sand and water play, paints, music and role play activities etc. I regularly arrange music and play sessions with other childminders at my setting and in public locations. This is a valuable opportunity for the children to mix and mingle and get to know other children and their "back up Childminders". I enjoy this tight private network while still enjoying the public arrangements offered in our community. My premises is 2 minutes walk to South Norwood Library, the sport ground and playground and 10 minutes walk to South Norwood Lakes and Selhurst Children's Centre where I have been taking both my children for over 7 years. 5 minutes walk to Norwood Junction Train Station and about 10 minutes to Selhurst Train Station, bus stops within few minutes walk, including X68 (express bus to Russel Square - first stop Waterloo) and 468, 157, 75, 410, 197 and many others. Closest schools - Heavers Farm and St Chad's, South Norwood Primary and Whitehorse Manor. Before living in London, I was heavily into Natural Horsemanship and used to instruct and assist children and adults, including people with additional or special needs, how to handle, ride and enjoy horses and life. In 2015/2016 I worked as a Teaching Assistant for 5 - 6 y/o - year 1 - in a local primary academy (not my children's school). I have experience with children of all ages and have always found ways to support them in my life through various friends and family and professionally. Additional certificates I will mention below. References available, I welcome you to message me to request these. I have many more additional training throughout 2017 & 2018 which can be viewed in my profile. I engage in webinars kindly provided by childcare.co.uk almost weekly as an additional professional support and continued growth.. Relating to childcare and education only, however, should you wish to know more about previous qualifications just ask. Please feel free to peruse my course work portfolios and vew any certificates, should you be interested. I encourage open realistic conversation about the needs of families. Personally, I found it very challenging working full and part time with 2 small children and traveling into the city every day, so I have an understanding of what it is like to leave your child/children and the stresses of work life balance. Please feel free to contact me if you want to discuss future childcare requirements. Contracted childminding rates depend on agreed times of day. Everyone's circumstances are unique. Below are the latest reviews for Rainbow EYES. Please note that reviews represent the subjective opinions of other Childcare.co.uk users and not of Childcare.co.uk. Parents must carry out their own checks and references on childcare providers to ensure that they are completely happy before enaging in the use of their services. Karen looked after my daughter from 18 months until she was nearly 3 and I couldn’t have wished for a better person to leave her with. She is so caring, open, honest and provides a stimulating environment for all the children in her care. She is full of energy and life and regularly takes the children on outings and does activities with them. She is obviously passionate about helping children learn and grow and I felt so secure leaving my daughter in her hands. I was regularly updated with photos and messages about how she was getting on. She also provides healthy, tasty food and looked after my daughter carefully in regards to the allergies she has. It is clear that Karen genuinely cares about the children and their families and is inspired to help people who need some extra support with their little ones. I would highly recommend Karen and feel extremely lucky to have found her! Wonderful caring and fun childminder! Karen looked after our daughter from when she was 8 months old until she went to preschool. She formed a really close bond with her and had a lot of fun with the friends she met there. Karen takes the children on great trips to museums, farms and locally to groups as well as having great premises at her home with a garden that the children enjoyed a lot. I knew I didn't have to worry at all when my daughter was with Karen, she was really well cared for, fed healthy food and I'd often receive photos of what they were up to during the day. Whenever she could Karen was flexible and during school holidays was also able to look after my son, who had lots of fun there playing with Karen's daughters. My daughter even had a sleepover at Karen's once and it was great to know she was in safe hands! 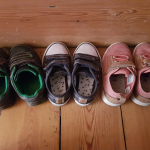 Taking on a childminder is a bit like extending your family and we were relieved and delighted when we found someone we were so happy with to look after our daughter. It's been sad moving on from Rainbow EYES but I think Karen will be part of our lives for a long time!